This project started with fabric that I “liberated” from my mother. 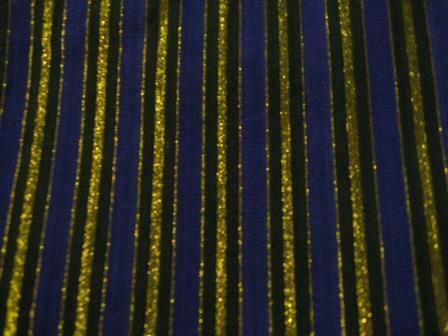 It is a royal purple, black, and metallic gold “something synthetic”. I did my first burn test on it, but I have no idea what it is. As soon as I saw it, I wanted to go glammed-out pirate with a serious frock coat. Once I started to think about how I would accomplish that, however, the idea morphed into something fit more for a merchant or noble class. 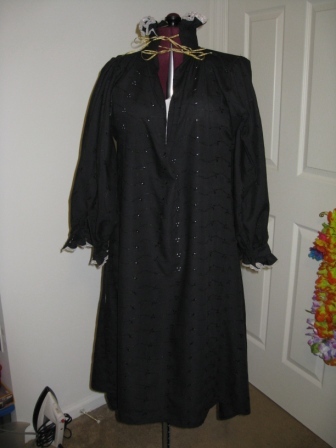 I started with a low-necked smock, which I have been dying to make, blackwork and all. I do not currently have pictures of said smock, because it turned into more of a learning experience than I expected. The smock is finished, but I think the neckline is too low and the body is a size or two too big. The length is perfect, and the sleeves seem right, but as soon as I put my existing corset on, the smock fabric bunched to the point of being uncomfortable. 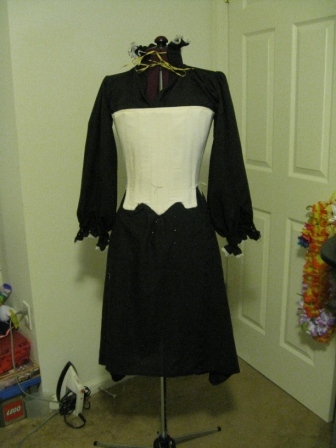 It will be revisited once I finish the kirtle and decide on a corset. Yes, I know that’s backwards in a bad way, but that’s what’s going to happen. 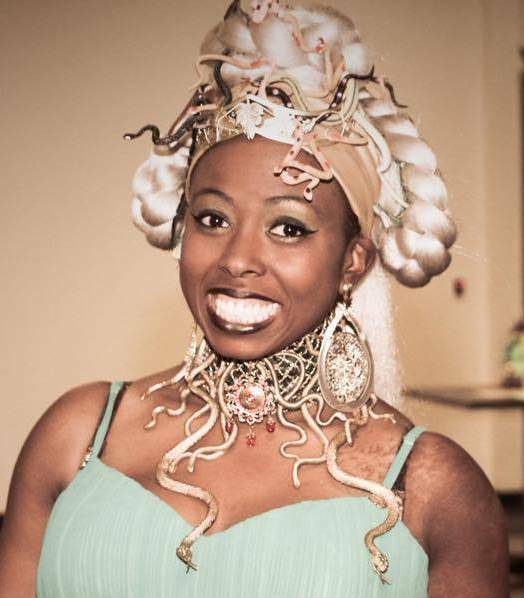 So, my class reunion was in the last year, and I was looking through my senior prom pictures. I picked my dress because I felt like a princess as soon as I put it on. For kicks, I made my mom bring the dress out of storage a few months ago so that I could try it on. 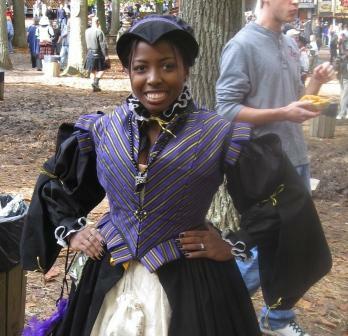 Well, it fit better than it did in high school, and I immediately knew that it was destined for faire garb. The dress was a scoop neck a-line made up of 16 panels. I wore a full gown slip under it for prom, so I knew that a Spanish farthingale would be no trouble. 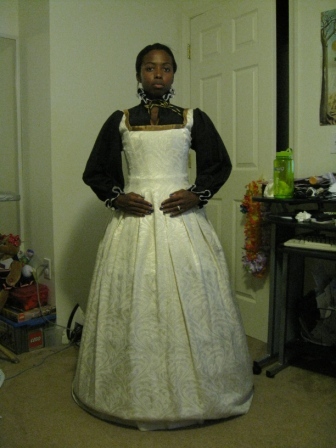 My dress dummy tried it on so that I could jot down the changes that would make the dress a passable kirtle/underdress. 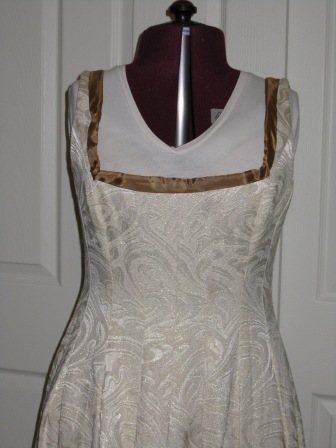 The first change was the neckline–converting it from scoop to square. I marked and stitched a square, using the straps as my sidelines, and going about one half inch from the lowest point of the U for my baseline. I cut a half inch seam allowance inside the stitching with my pinking shears. The second change was the hidden zipper closure in the back. I had already gutted the dress of its netting, leaving only the lining above the hip area. I flipped the dress inside out and added boning (cable ties) about a half inch from the zipper. 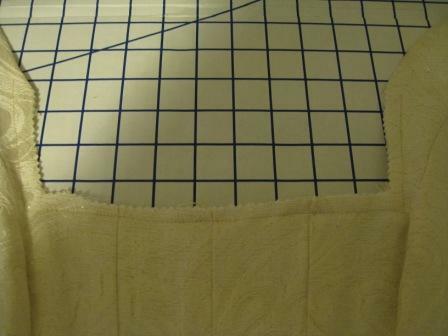 For simplicity’s sake, I used double fold bias tape to make channels and stitched that to the lining. 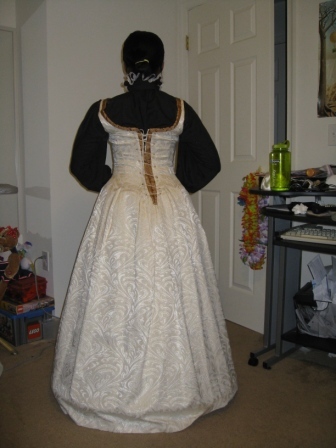 Once the boning was in place, I made single fold bias tape out of taffeta scraps and used that to bind the edges around the new neckline and over the zipper, which I left in, but inoperable. Removing the zipper pieces would have been more trouble than it’s worth and the job was easier to just work around it. The final step is eyelets. I will be going the spiral laced route. 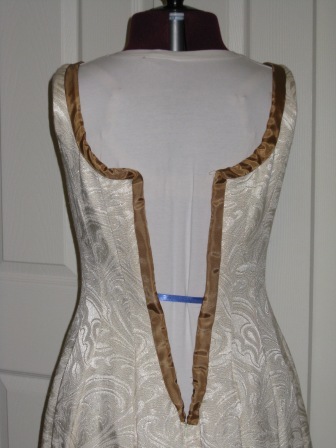 The neckline sags a bit in the middle, so I will probably have to pin or hook the kirtle to my corset to keep the line intact. 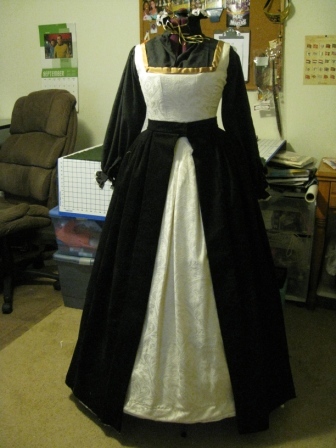 Next up: making a Spanish farthingale to fit the circumference of the kirtle. 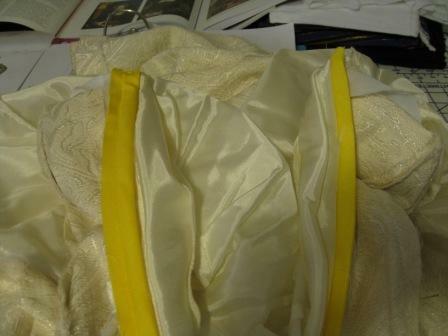 For those still wondering why I torture myself by backwards engineering the underpinnings, I simply did not want to cut the existing dress into pieces, when a full underdress would suit my doublet gown better. 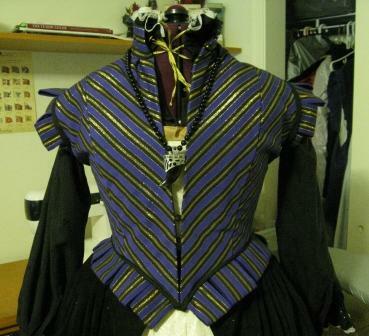 See the Farthingales page for the progress on that. 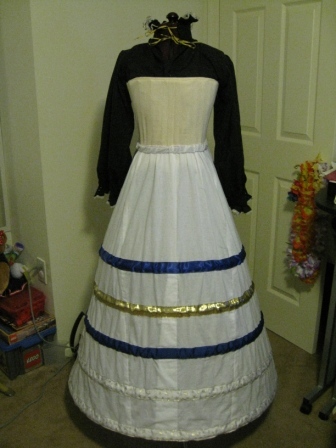 Update, 5/25/09: This project is on hold until my opening day ensemble is complete…that, and the farthingale caused me much anger and stress. It is currently in the back of the closet reflecting on what it has done. 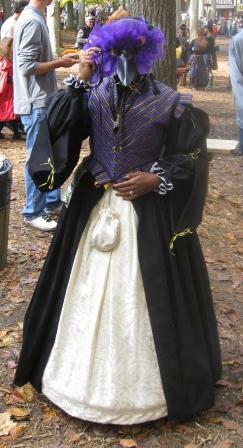 I plan on wearing this gown for the cooler faire months anyway. Update, 8/24/09: I’m picking up this project with new motivation. I have dubbed this project “Lady Corvina” in honor of the Baltimore Ravens colors and the mask that I have commissioned (my brother is a crafty fellow). 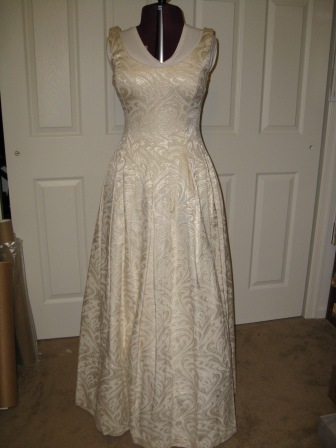 It will likely be my shiniest gown, and I can’t wait to start working with the fabrics. I went to a new fabric store with hopes of finding inexpensive velvet (which I did), but walked out with a thin sort of courdoroy instead. 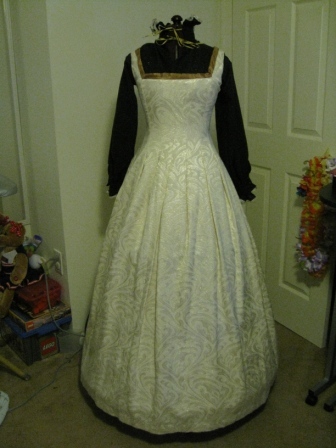 It has a little horizontal stretch, but I’m going to use it anyway because the drape feels right. 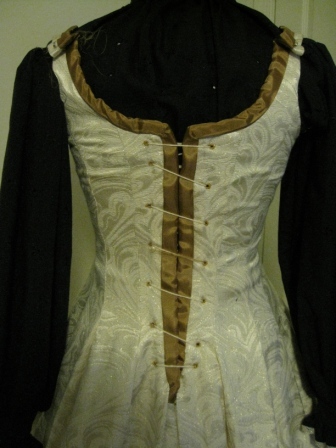 First up, a black–yes, black, high necked smock with white/gold lace trim. It’s going to be beautiful. It seems appropriate that I finished the base layer in time for the new month. The smock is done, and I love the way it looks. I didn’t space the gathering at the collar right, so it fits a bit off, but it fits, and that’s something. The smock is made of a black, embroidered cotton blend–I’m almost positive now (not so much when I bought it) that it has polyester, but it’s much too late to worry about that. The fabric store where I picked the fabric up is a “last stop” warehouse type of place, and not all fabric is labeled. 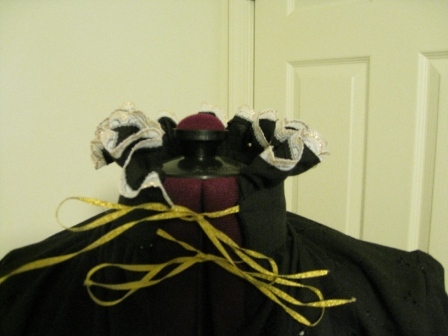 I used a white and gold lace trim for the ruffles and thin gold ribbon for the neck ties. The cuffs have large hooks and eyes, since I had them on hand. The first fitting went well. I put on all the layers, which fit to my satisfaction. The corset (first one I’ve ever made) is less boned than I have become accustomed to; but, it is extremely comfortable with this ensemble. It stretches a bit to conform to my bits, and, although it tends to slide with extended wear, I wouldn’t wear any other style with this ensemble. 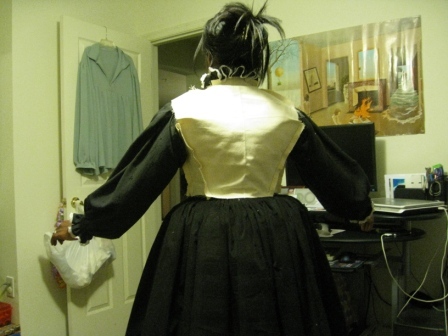 The farthingale is a hideous mess, but I am learning to love it, since I can fit through doors on the first try. It’s too long, but not by much. For the fitting, I just rolled it at the waistband. 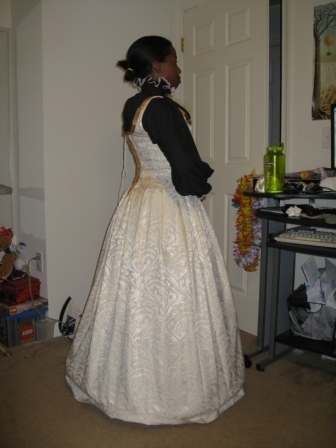 The kirtle fits better now than it did without layers, at the senior prom, 20 pounds ago. Who knew? 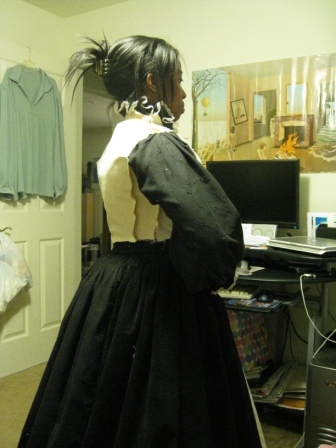 I need to find a more appropriate cord for the kirtle’s lacing, but the [butcher’s] string worked for the fitting. I will be taking in 1 1/4 inches from the straps and 2 inches from the hem. I was quite happy gliding around in just the under parts of this ensemble. 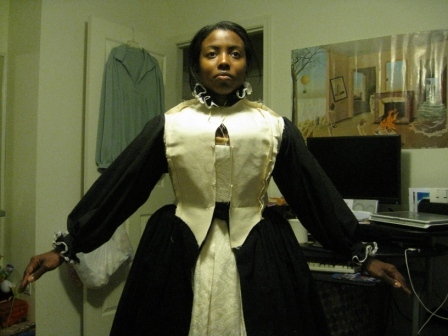 If the kirtle’s construction was more period appropriate, I would throw on a bodice and call it a day. 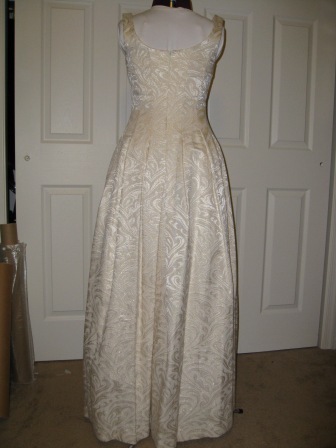 I took the measurements for the gown, and plan on starting the skirt this week. 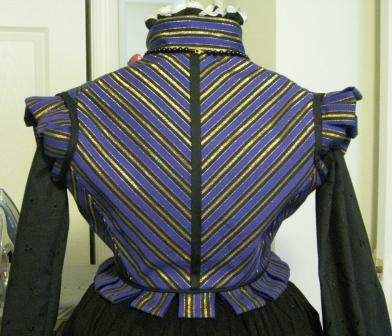 The skirt will be one layer of corduroy (thin lines) with accents from the bodice fabric. For the time being, I am going to make the skirt blank, it will be a separate piece anyway, and I don’t want to accent the skirt until I am sure that I have enough bodice fabric in the right sized pieces. I have a finite amount of it, and cannot afford to take any chances. Plus, I will be able to wear the skirt with anything if it’s blank. I would like to make the skirt with front closures, but we’ll see how it goes. I started the skirt, and realized that it’s lighter than I remembered. I found just enough cotton [sheeting] to line it. Thank goodness for remnants. My preference would be a satin-y lining fabric, but I want to get this done, and I don’t have time to run up to my new fabric haven. The corduroy came from a standard size bolt, so I didn’t have to do a bunch of pattern laying and cutting. I unrolled and cut three panels worth of 45″ sections. That should be enough for cartridge pleating and a standard hem. UPDATE: I’m not quite sure how I forgot to update this page, so I’ll do it now. 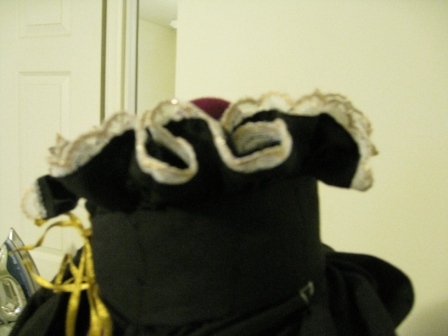 If I remember correctly, I got very angry with the doublet fittings, and decided to just throw it together and hope for the best. Lucky for me, it turned out close enough to fit snugly in the right spots. I love the black piping with the looped tabs! I made Spanish sleeves from the corduroy, interlined with canvas, and lined with black cotton remnants. It was very warm. I also made an attifet from a combination of all the project’s fabrics–smock fabric for the bag, doublet fabric for the band, corduroy and craft wire for the pointed bit up front. 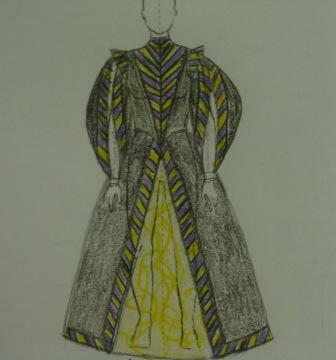 This project was a great way to explore the doublet style, which I do plan on revisiting. I found that coming up with a theme allowed me to be creative inside of my own defined space. The raven mask that my brother created was perfect for this. You did a great job on that doublet! and 8 times out of 10 I go by the smell of the burn, especially with blends that can be confusing if you just go by the ashing.